For a list of stove types, see Stove (disambiguation). The stove is connected by ventilating stove pipe to a suitable flue, which will fill with hot combustion gases once the fuel is ignited. The chimney or flue gases must be hotter than the outside temperature to ensure combustion gases are drawn out of the fire chamber and up the chimney. 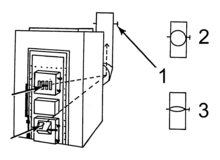 A damper in a stove chimney flue (1) controls air supply by being set open (2) or closed (3). Keeping the air flowing correctly through a wood-burning stove is essential for safe and efficient operation of the stove. Fresh air needs to enter the firebox to provide oxygen for the fire; as the fire burns, the smoke must be allowed to rise through the stove pipe, and exit through the chimney. To regulate air flow, there may be damper devices built into the stove, flue, and stove pipes. The highest heating efficiencies on closed appliances can be attained by controlling the various supplies of air to the stove (operating the air controls correctly). On modern stoves, owner's manuals provide documented procedures. Fully open air controls may lead to more heat being sent straight up the chimney rather than into the room (which reduces efficiency). The biggest problem with leaving the air controls fully open on many stoves is “overfiring”. Overfiring is caused when too much heat is generated within the fire chamber, which will lead to warping, buckling and general damage to the stove and its internal components. Different stoves have different numbers and types of air controls. Modern building techniques have created more airtight homes, forcing many stove manufacturers to design their stoves to permit outside air intakes. Outside air can improve the overall efficiency of the stove as a heater by drawing cold combustion air directly from the outside instead of drawing preheated air from the room that the stove is in. Many modern stoves can optionally use an outside air intake. Many manufacturers supply the necessary parts in kit form (an Outside Air Kit, or OAK). When considering an outside air kit, it is important to know that the air must come in from below the level of the stove. For example, a basement stove may not safely use an outside air kit. This is to prevent a reversal of venting in which very hot flue gasses are exhausted through a (usually PVC) air intake pipe, which could lead to a structure fire and/or hot flue gasses being released into the structure. Firewood is usually measured in English-speaking countries in a quantity called a cord, measuring 128 cubic feet (3.6 m3) (an orderly 'tightly packed' stack 4' high x 4' deep x 8' wide). Firewood may be purchased by the cord, or by a fraction of a cord. The term "face cord" is commonly used to describe varying volumes of wood. Nominally it means 4' x 8' x an unspecified third measurement, but the term is often used by unscrupulous sellers to mean varying amounts. Experienced firewood buyers and honest firewood sellers do not usually use the term "face cord". When purchasing, cutting, or collecting firewood, it is good to be aware of the difference between hardwood and softwood. Both hardwood and softwood have similar energy contents by mass, but not by volume. In other words, a piece of hardwood would usually be heavier and have more available energy than the same sized piece of softwood. Hardwoods, derived from trees such as oak and ash, may burn at a slower rate, resulting in sustained output. Many softwoods are derived from conifers, which are fast growing and may burn at a faster rate. This is one reason why softwood pellets (for pellet stoves) are popular. The primary advantage of hardwoods are that they tend to contain more potential energy than the same volume of a softwood, thus increasing the amount of potential heat that can be stacked into one stoveload. Hardwood tends to form and maintain a bed of hot coals, which release lower amounts of heat for a long time. Hardwoods are ideal for long, low burns, especially in stoves with a poor ability to sustain a low burn, or in mild weather when high heat output is not required. Not all hardwoods have a higher potential energy content than all softwoods. Wood varies by species and even individual trees (a tree with many years of slow growth will have a higher BTU content than a tree of the same species and same size than a tree with a few years of rapid growth). Osage orange, also known as hedge, is perhaps the highest-BTU wood that is common in North America. It is possible that this myth originated with old-fashioned stoves and fireplaces. These "appliances" did not require seasoned wood, and frequently did not receive it. As a result, they often experienced very low flue temperatures- usually in flues that were not insulated as modern flues are. The combination of low firebox temperatures due to high moisture content in the wood and low flue temperatures due to lack of insulation led to high levels of creosote accumulation. Burning a wood that emits a lot of sparks (such as pine) in an old-fashioned fireplace or stove will lead to sparks going directly into the flue, which can lead to a dangerous chimney fire if the flue is coated in creosote. Modern stoves which are operated properly do not cause this high level of creosote accumulation. While different wood species do contain varying levels of volatile organic compounds, the difference is academic to the wood burner. All woods produce creosote. All woods will cause creosote accumulation if burned improperly. So-called dangerous woods such as pine are in fact safer than woods such as oak, as they will burn hotter and thus help keep flue temperatures up, and their fast seasoning will help ensure that novice wood burners are burning reasonably dry wood. Dry wood produces more usable heat than wet wood, since the energy used to evaporate the water from the wood is lost up the chimney. Freshly cut wood (known as green wood) has a high moisture content. Different wood species have different moisture contents, which also vary tree to tree. Burning fuel that is mostly water uses much of the combustion energy to evaporate the water. This results in low firebox temperatures and low flue temperatures. Firewood with a moisture content below 20 per cent by weight can burn efficiently. This is the "free" moisture content absorbed in the wood fibers, and does not include the chemically bound hydrogen and oxygen content. Moisture content can be reduced by outdoor air-drying ("seasoning"), for a period of several months in summer weather. Solar-powered or fuel-fired kilns can accelerate the drying process. Creosote that does escape may still not be harmful. It leaves the wood in gaseous form. It will not condense on surfaces above 250 degrees Fahrenheit (121 °C). Modern flues are insulated to help ensure that they do not fall below this temperature during normal stove operation. Creosote accumulation can be dangerous, as it is flammable and burns hot. If a flue is coated with creosote and ignited, perhaps by a spark going up the flue, it can cause a serious chimney fire that can lead to a structure fire. This can be avoided by using modern stoves and flue standards, burning dry wood, keeping your fires hot enough to maintain flue temperatures of at least 250 degrees F (121 °C) at the top of the flue, and proper chimney cleaning as needed. Multi-fuel stove designs are common in the United Kingdom, Ireland and Europe. They burn solid fuels only, including wood, wood pellets, coal and peat. They are typically made of steel or cast iron. Some models are also boiler stoves, with an attached water tank to provide hot water, and they can also be connected to radiators to add heat to the house, though they are usually not as efficient as a dedicated wood boiler. A catalytic wood stove will re-burn the gasses from the firebox in a catalyst- a matrix of steel or ceramic plated with a catalyst that allows combustion of these gasses at much lower temperatures than would ordinarily be possible. This is why among modern stoves, catalytic models tend to be much better at achieving low, even heat output, which is desirable in warmer weather. In a conventional stove, when wood is added to a hot fire, a process of pyrolysis or destructive distillation begins. Gases (or volatiles) are evolved which are burned above the solid fuel. These are the two distinct processes going on in most solid fuel appliances. In obsolete stoves without secondary combustion, air had to be admitted both below and above the fuel to attempt to increase combustion and efficiency. The correct balance was difficult to achieve in practice, and many obsolete wood-burning stoves only admitted air above the fuel as a simplification. Often the volatiles were not completely burned, resulting in energy loss, chimney tarring, and atmospheric pollution. The technology is not actually new; it has been used for decades in industrial coal-fired boilers intended to burn coal with high volatile content. The basic principle of controlling combustion by reducing the air supply means that very often there is a reduction zone/conditions within the stove. This means that carbon dioxide is often "reduced" to carbon monoxide, which is highly poisonous and must not be allowed to escape into the home. This can occur if the stove or chimney has not been cleaned or there is insufficient ventilation. Carbon monoxide detectors or alarms should always be installed according to manufacturers' recommendations where a wood stove is in use. Not all smoke detectors detect carbon monoxide. Under the United Kingdom's Clean Air Act, local authorities may declare the whole or part of the district of the authority to be a smoke control area. It is an offence to emit smoke from a chimney of a building, from a furnace or from any fixed boiler if located in a designated smoke control area. It is also an offence to acquire an “unauthorized fuel” for use within a smoke control area unless it is used in an “exempt” appliance (“exempted” from the controls which generally apply in the smoke control area). The current maximum level of fine is £1,000 for each offence. The United States Clean Air Act requires that wood stoves be certified by the Environmental Protection Agency (EPA). These devices meet a particular emissions standard of no more than 7.5 grams per hour for non-catalytic wood stoves and 4.1 grams per hour for catalytic wood stoves. Washington State has stricter requirements of a maximum of 4.5 grams per hour. However, the EPA has had no mandatory emission limits for pellet stoves, indoor or outdoor wood boilers, masonry stoves and certain types of wood stoves that are exempt from EPA regulation. EPA is developing new regulations and in 2015, these will begin to come into effect, establishing mandatory emission limits for almost all wood-burning appliances (fireplaces, chimeneas, and some other special appliances will still be exempt). In some places, such as the Caribbean, Central America and South America, many houses have wood-burning stoves that are used indoors without any means of proper ventilation. Smoke stays in the house, where it is breathed in by the residents, harming their health. Nearly 2 million people are killed each year by indoor air pollution caused by open-fire cooking, mostly women and children, according to the World Health Organization (WHO). The cutting of large amounts of firewood also endangers local forests and ecosystems. Non-governmental organizations (NGOs) such as Rotary International are actively assisting homeowners in constructing more fuel-efficient and safe wood-burning stoves. One design is called the Justa stove, Just stove, Ecostove, or La Estufa Justa. Justa stoves are made out of such materials as adobe, cement, and pumice, with chimneys. Other wood-burning stoves types are also being introduced to these communities, such as rocket stoves and haybox stoves. A rocket stove is up to 30% more fuel efficient than a Justa stove, but a small portable rocket stove (for cooking) does not have a chimney and is suitable for outdoor use only. Bigger rocket stoves are connected to chimney or flue-exhaust pipe. The haybox stove is another outdoor wood-burning stove. Haybox stoves use straw, wool, or foam as an insulator, reducing fuel use by up to 70%. Italy is one of the biggest markets for pellet-burning stoves in Europe, having around 30% of all homes using wood for some heat. This means about 5 million homes have a wood fueled stove or cooker. Franklin stove, originally invented by Benjamin Franklin, is a more efficient type of wood-burning fireplace. It was finicky and never caught on, but many stoves continue to be referred to as "Franklin" stoves. Carl Johan Cronstedt is reported to have increased efficiency of wood-burning stoves by a factor of eight in the mid-18th century. A Fireplace insert converts a wood-burning fireplace to a wood-burning stove. A fireplace insert is a self-contained unit that rests inside the existing fireplace and chimney. They produce less smoke and require less wood than a traditional fireplace. Fireplace inserts come in different sizes for large or small homes. Down draft or cross draft gasification stoves, i.e. Dunsley Yorkshire, Welkom 600, Avalon Arbor™ wood stove, XEOOS. Boiler Stoves provide hot water as well as space heating. A backboiler can be an optional insert added to the back of the firebox, or a wrap around water jacket that is an integral to the stoves structure. The choice determines how much of the stoves output goes to space heating as opposed to heating water. Rocket mass heater s are a type of fuel-efficient stove, named in the 70's, but dating back millennia in concept. A super-hot chimney above the fire draws the flames sideways and up, blending hot fuel and air into a quick, hot, clean-burning fire that takes little wood, leaves little residue, and has lots of uses. Ceramic-tiled cocklestove wood-burning stove in an Alsatian house, Strasbourg, France. Wooden laundry-drying racks hang over the stove. ^ This contradicts a claim made in the American History Channel Network's show 101 Inventions That Changed the World, re-broadcast on 30 August 2016, which credited Ben Franklin as the inventor of the wood stove, ignoring the German origin. Franklin did patent an improved stove ca. 1744, including several variants such as a front of fireplace heating unit of cast iron, but his stove was based on existing stoves of German origin (i.e. amongst the many Pennsylvania Dutch) found in the Province of Pennsylvania. ^ "Wood-burning stove". 1557: First patent issued for a wood conserving stove in Strasbourg. ^ Greenberg, Gail (1981). Energy efficient building handbook. 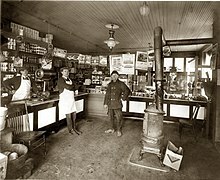 Business Communications Co. p. 30. ISBN 978-0-89336-283-6. ^ Planning Portal (UK). "Approved Document J - Combustion appliances and Fuel Storage systems." 2010-05-01. ^ Department for Environment, Food and Rural Affairs (Defra), UK. "Smoke Control Areas." Accessed 2010-12-06. ^ U.S. Environmental Protection Agency (EPA). Washington, DC. "List of EPA Certified Wood Stoves." 2010-02-22. ^ "Forest-saving stove programs". Trees, Water & People. Retrieved March 8, 2012. ^ Scott, Peter. "Simple plans to build a Justa stove" (PDF). Aprovecho Research Center. Retrieved March 8, 2012. ^ EPA. "Fireplace Inserts." "Burn Wise" program. 2010-03-03. ^ Roth C., “Micro Gasification: Cooking with gas from biomass“ 1st edition, released January 2011 Published by GIZ HERA – Poverty-oriented Basic Energy Service. ^ Wisner, Erica. "The Rocket Mass Heater or Heating Rocket Stove". Retrieved 8 January 2015. Wikimedia Commons has media related to Wood-burning stoves. This page was last edited on 24 April 2019, at 08:17 (UTC).